Myself and my mentor Angel Negrín hold to the firm belief that #EveryWeekIsNegroniWeek. I created this cocktail as a series of drinks for Negroni Week and love how the smoothness of St-Germain mellows out the bitterness of Campari. I like to keep Negroni bottled* and ready to go so that I can use it to mix with cocktails or sip it whenever I so desire. The bonus of keeping it bottled is that the Gin, Sweet Vermouth and Campari will blend together more and more with each passing day! Combine ingredients in tin over cracked ice and stir. Strain into rocks glass over one big rock. Express Orange peel and use as garnish. 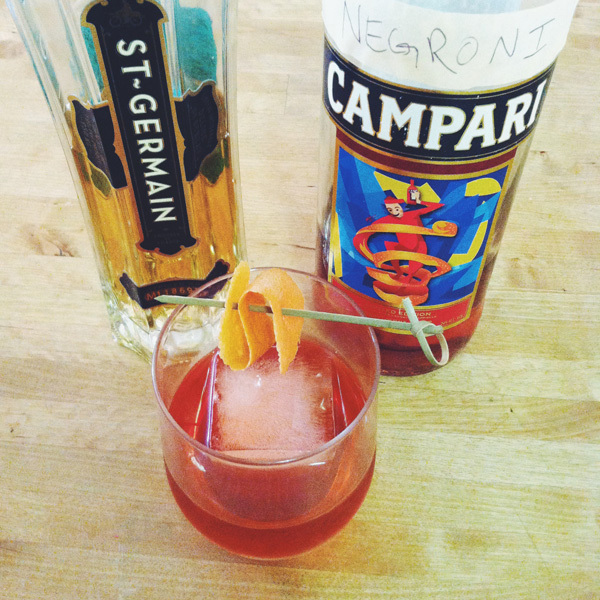 *For this particular bottled Negroni I used Plymouth Gin, Martini & Rossi Sweet Vermouth and Campari.